Every year Apple trots out a shiny new smartphone, and let’s be honest — their track record is pretty good. Building on the smooth and rounded design of the iPhone 6, does this new model deserve a place in your pocket? Let’s take a look; and at the end of this review, we’re giving our iPhone 6s away to one lucky reader! Watch the video review for some bonus entries! The iPhone 6s is virtually identical to the iPhone 6 in both size and design. Without using them, you wouldn’t be able to tell them apart were it not for the small “s” on the back of the unit and about 0.2mm additional thickness in the new model — until you pick them both up and one difference becomes clear. The iPhone 6s is noticeably heavier than its predecessor, weighing in at 143g compared to the past model’s 129g. This extra weight is also reflected in the 6s Plus, which is a whole 20g heavier than last year’s phablet. The numbers may seem small, but the added weight was immediately noticeable. That’s not to say the iPhone 6s is heavy, and the phone still feels perfectly weighted in the hand — it’s not top heavy, a problem I noticed (and immediately couldn’t un-notice) with last year’s 6 Plus. The reason for this added weight is a reassuring one. This is the first time Apple has used 7000 series aluminium, a zinc alloy that’s far more difficult to machine than the more malleable 6000 series found in the iPhone 6, 6 Plus and iPad Air. If ever proof was needed that Apple is learning from their mistakes, rolling out the world’s toughest aluminium in response to last year’s “bendgate” headlines would be it. The words “reassuringly heavy” haven’t been this applicable in a phone review since the days of the Nokia 3210. Design-wise the 6s is par-for-the-course in terms of incremental iPhone upgrades. This is the third “S” model iPhone, and it continues the tradition of refining the previous year’s release by bringing the internals up to date with little in the way of radical redesigns. There really are only two areas in which the iPhone 6s introduces what could be called “new” features, and the first is the rebranded Force Touch technology found on the Apple Watch (and in the latest MacBook trackpads). 3D Touch, as it is now known, is the one new feature that looks set to transform the way we use our iPhones. By using pressure sensitivity on the touchscreen, you can now squeeze your iPhone harder to access more functions. This essentially adds another tap command to your iPhone — a bit like middle-click on a computer. On the homescreen you can 3D tap an app’s icon to bring up the context menu, which allows you to skip directly to a certain function (like composing a new Mail message). When typing, 3D press and hold the keyboard in order to move the cursor with never-before-seen accuracy. Certain app developers have also used the pressure sensitivity to mimic traditional analogue input, like Magic Piano. A charge of haptic feedback lets you know when you’ve activated a 3D tap, along with some visual feedback that lets you know when you need to press harder. It takes about 30 seconds to get used to, but you won’t want to be without it once you’ve used it a few times. With a bit of practice you’ll notice how much faster you can access certain features, like opening the Camera app in selfie mode, jumping straight to a new tab in Safari or creating new Reminders or Notes in half as many taps. It’s also exciting to see third-party developers get in on the action — you can now use Shazam to jump straight into identifying a song without first “opening” the app. This feature is only set to become more useful and prolific as app developers get their hands on the updated iOS 9 developer tools, though it’s already very useful when paired with Apple’s built-in apps. Other big changes introduced by the iPhone 6s will be of particular interest to shutterbugs and the selfie-obsessed, as both the rear and front-facing cameras have been bolstered with more capable sensors, upping the megapixel counts to 12MP and 5MP respectively. This brings 4K video to the iPhone for the first time, using roughly 350MB per minute of video Live Photos & 4K: Why You Shouldn’t Buy a 16GB iPhone 6s Live Photos & 4K: Why You Shouldn’t Buy a 16GB iPhone 6s If you want to take advantage of the new iPhone 6s camera, you'll probably want to avoid picking the 16GB storage option. Read More to capture the action in a format four-times the size of standard 1080p. While it might seem like a logical leap in quality, I don’t see 4K video on the iPhone as a particularly useful feature. Not only does it take up far more space than HD, it offers no real benefit unless you already own a 4K TV or monitor (and most of us don’t Why Buying A 4K TV Right Now Is A Waste Of Money Why Buying A 4K TV Right Now Is A Waste Of Money With an obvious price difference between the new generation of 4K TVs, and older Full HD models - do you really need 4K? We think not, and here's why. Read More ). If you want to use your iPhone for video projects, short films or documentaries then 4K offers both a boost in source quality and an opportunity to crop your footage (and get all Ken Burns about it) without losing quality — but these are hardly consumer demands. In terms of available space, you’ll get about three hours of 4K video on a 64GB iPhone 6s. The other big change to the iPhone 6s primary camera is the introduction of Live Photos, which essentially captures a few seconds of video prior to and after you’ve shot a picture, bringing otherwise still images to life. A small, reduced-quality .MOV file is recorded along with the standard .JPG image, roughly doubling the space required by a standard static photo. These moving images can only be viewed by other iOS or OS X users, and if you try to send a Live Photo to a friend without a compatible device they’ll simply receive a static .JPG. When you’re flicking through your Photos app, Live Photos will spring to life as you get to them, which is a nice touch. Fortunately the feature can be toggled on and off using a circular icon at the top of the camera viewfinder, so if you see no value in the feature or would rather save the space you can leave it off. Interestingly, images taken with the front-facing camera can also be Live Photos, adding a fun element to selfies which seems to compliment the concept of messing around, taking pictures with your friends or loved ones. For those of you who really love your selfies, the iPhone 6s’ killer feature will arguably be the new 5 megapixel front-facing camera. Not only is the resulting image clearer and less grainy, low light performance has been massively improved — particularly when using the flash, which uses the iPhone’s screen to both illuminate subjects and balance the whites for better skin tones. Live Photos taken with the front-facing flash enabled show off how good the feature is at providing a healthy, human-like glow in the face of poorly balanced skin tones. It should go without saying that new the iPhone 6s (and 6s Plus) is fast. How fast? It’s probably held back by the speed of iOS 9’s animations — put it that way. The new A9 chip promises 70% improved performance over the iPhone 6, though there aren’t a huge amount of apps around to take advantage of that grunt yet. In addition to a new central processor, the iPhone 6s GPU has also been overhauled — with Apple claiming a 90% improvement in rendering graphics than the previous model. I tested the phone with 3D Mark and scored an impressive 26,651 — just short of Microsoft’s Core i3 Surface Pro 3 and ahead of the nVidia Shield tablet edition NVIDIA Shield Tablet Review And Giveaway NVIDIA Shield Tablet Review And Giveaway NVIDIA has released a full-size tablet version of the Shield – aptly named the NVIDIA Shield Tablet – and we've been playing around with one. Read More . The result is a silky smooth UI that barely hiccups even at the busiest of times. Tabs slide in and out of view in Safari, apps switch back and forth effortlessly and activating Control Center or Notification Center doesn’t result in a jerky mess. There is of course another reason the 6s packs so much punch: double the RAM of its predecessor. This is the first iPhone with a full 2GB of RAM, putting it on equal standing with the iPad Air 2 in terms of available memory. As pointed out in our iPad Air 2 review iPad Air 2 Review And Giveaway iPad Air 2 Review And Giveaway Read More , a lack of RAM has been a noticeable performance bottleneck on the last few generations of iOS devices, and doubling the system’s available memory certainly goes some way toward rectifying this. More RAM essentially means that your iPhone will remember more things. You can now keep more tabs active in Safari without having to reload as many pages, or switch between three or four apps without losing your place in any of them. Intensive processes like connecting music apps together with AudioBus AudioBus for iOS: The Future of Music Creation Has Arrived AudioBus for iOS: The Future of Music Creation Has Arrived The iPhone, iPad and iPod Touch are no longer toys when it comes to serious music production. No more will your "crippled" iOS devices be restricted to GarageBand when it comes to laying down a... Read More or rendering video in iMovie won’t slow your iPhone down like it does on older devices either. There are other speed improvements too — Touch ID is noticeably faster than it was on the iPhone 6 and 5s, no longer requiring you “click and hold” to unlock your iPhone. At times I felt this feature was too good, not giving me time to peruse missed notifications on the lockscreen. But all of this extra speed seems to come at a price, at least when it comes to the smaller iPhone 6s. 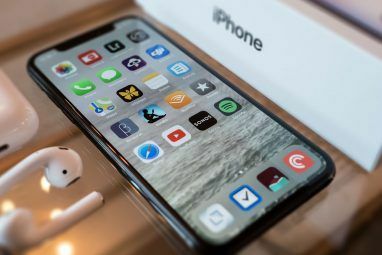 When I reviewed the 6 Plus last year iPhone 6 Plus Review and Giveaway iPhone 6 Plus Review and Giveaway The 5.5-inch iPhone 6 Plus is Apple's latest and perhaps strangest addition to its range of tablets and smartphones. Read More I was astounded at how good the battery life was — at times lasting two whole days with only moderate use. Once I had an iPhone 6, it was apparent that this wasn’t the case across the board, but battery life was still tolerable. 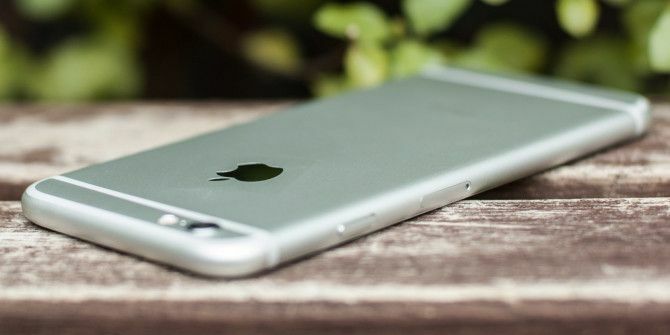 Fast-forward to the iPhone 6s, and battery life has taken a tumble. While testing the unit I found it was barely lasting a day, and though I was intentionally playing with the new features, taking Live Photos and receiving plenty of haptic feedback when using 3D Touch; playtime didn’t seem to last long enough. Sure, you can limit your use of Live Photos, turn off the always-listening Siri and swear to never shoot video in 4K quality — but why buy a new phone if not to use all it has to offer? Users particularly concerned about battery life may want to opt for the larger, phablet-sized iPhone 6s Plus Should You Buy The Bigger iPhone 6 Plus? Should You Buy The Bigger iPhone 6 Plus? The term "phablet" very much applies to Apple's recently announced iPhone 6 Plus, but there's more to it than just a bigger screen. Read More if they can fit it in their pockets. It wouldn’t be a new iPhone review if we didn’t talk a bit about the software that powers everything. Though you’ll probably already have iOS 9 on your previous-generation device What's New in iOS 9? What's New in iOS 9? Want to know what features your iPhone will be getting with the release of iOS 9 in September? Curious as to whether your device will be compatible? You're in the right place. Read More (it’s even compatible with the ageing iPhone 4s), iOS 9 is at its peak on the latest handset. 3D Touch reminds us that Apple is still capable of marrying hardware innovation with common-sense software solutions. When using the iPhone 6s, it really feels like this was the biggest iOS 9 feature all along — even though the vast majority of devices won’t be able to take advantage of it. Some will interpret this as a great reason to upgrade now, while others will see it as a precursor for what’s to come. iOS 9 isn’t packed with new features, instead building on much of what iOS 7 and 8 introduced. The UI has been tweaked, with more rounded corners and the “San Francisco” font previously seen on the Apple Watch. Siri and Spotlight are now a lot more intelligent, providing suggestions based on your habits (like people to call or apps to launch) and bringing the unit conversion and other time-saving OS X Spotlight features to iOS at last. Navigation has been improved across the board, with a better app switcher that feels more modern and useful than its iOS 8 counterpart. You can now skip between three or more apps with less swiping, and Safari links from other apps (like Messages) now include a quick “Return to app” label in the top-left corner which allows you to quickly resume where you left off. Of course, there are new features too: a rebuilt Notes app that can handle images and documents, a News app for those of you in the US, a smarter Calendar that scans your inbox for events and an iCloud Drive app for accessing your Apple cloud storage as if it were a real folder How to Access and Manage iCloud Drive Files From Any Device How to Access and Manage iCloud Drive Files From Any Device iCloud Drive is a handy tool, but accessing your files can be a little confusing since Apple's cloud storage experience really differs depending on your platform or device. Read More (a long time coming). Oh — and Apple Music is far less wonky in iOS 9, doing away with many of the bugs and inconsistencies found in the original release. The iPhone 6s represents a sizeable leap in smartphone performance, with a noticeable increase in both speed and available memory thanks to the A9 chip and an extra dollop of RAM. 3D Touch is one of the most genuinely useful additions to any smartphone (let alone the iPhone) in years, and the feature is set to change the way we all use our devices in the years to come. The rather sharp front-facing camera provides ample reason to upgrade if you’re addicted to selfies Stop Hating On Selfies: 3 Reasons You Should Love Them Stop Hating On Selfies: 3 Reasons You Should Love Them Selfies are all too often written off as the egotistical masturbation of brainless teenagers, but that's a superficial take on them. Here's why. Read More , but you’ll have to decide for yourself whether Live Photos are worth the extra space they consume. Sure — 4K video is nice, but 1080p is more than enough for most people (and will be for some time yet). One word of warning: if you’re thinking of buying an iPhone 6s and you’d like to shoot Live Photos, 4K video and larger 5 megapixel selfies; you should definitely avoid the 16GB model Live Photos & 4K: Why You Shouldn’t Buy a 16GB iPhone 6s Live Photos & 4K: Why You Shouldn’t Buy a 16GB iPhone 6s If you want to take advantage of the new iPhone 6s camera, you'll probably want to avoid picking the 16GB storage option. Read More . The fact that Apple still bothers with such a small storage option is perplexing given the fact that you’ll have roughly 11GB free space once iOS has been accounted for. The iPhone 6s’ biggest let-down is the battery, though opting for the larger model iPhone 6s Plus will offer some respite in this department. The rest of you will have to make do with aftermarket battery cases and portable charging bricks instead. Explore more about: iPhone, iPhone 6s, MakeUseOf Giveaway. really want a iphone 6s now! I'll honestly be devastated if I don't win, but I don't think I have reason to be shocked or surprised. Just let me win this time. No need further explanation. This would be the perfect gift, I would like to share. I want this for CHristmas. I do not own any smartphones like this one so please.. It's really hard to get it. So, i just try. I really want touch iPhone6s.. I really hope I can get iphone6s. but it's just in my dreams or my imagination only. I love the 3D technology, but there are still some things that would make me real skeptical about spending money for this phone. Like the battery power, I love that it has the new camera and the RAM power, but I must have my battery longevity. Looks sleek. Hoping that the iPhone 7 offers a 4" screen option next year. I really appreciate your thorough review. It is information I know is very relevant and I can base my purchases from it. Thanks! I need a new iphone. Hope I win..
Great review as usual. Following make use of from last two years, nice to see it's growing into other areas. 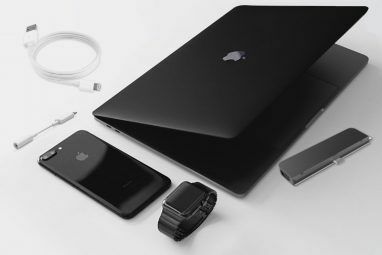 I specially like tech updates and reviews with giveaway. Trying giveaways from long time, but no luck till now. I understand lots of people participate. I have my fingers crossed. Let's see. Keep up the good work. The 6s looks like a winner. Would love this one. I currently have a Galaxy S4 and am thinking about getting this or the S6. Is there any comparison between the two? And i enter again in hope of winning. Good luck everyone we all have a good chance. Thanks for the chance. I would love this! Why has no one commented yet? This is impressive.